Palm Isles was the farthest north we went this season. The Townsville area was immensely enjoyable for us and we run out of time to visit Cairns, Lizard and the outer reef that is so close to Lizard. As the cyclone season was around the corner we turned back leaving northern latitudes for next year. Most cruisers in this route started turning back with the first northerlies a couple of weeks before us. Except for some small fishing boats there was nobody else in this outstanding place. Oscar decided to try fishing and soon enough he caught a wonderful fish, big enough for several dinners. We would have liked to make another stop at Cape Upstart as we had excellent references for this place but the forecast was threatening the return of the south easterlies so we decided to exchange a day sail for an overnight towards Gloucester Passage, the idea was to get a mooring at the ECO resort and wait there for the next window to keep going south. Like other times before our great idea got crushed by the conditions. I started suspecting this was going to happen as I could feel the seas increasing from behind during my watch just before sunrise. After a quiet overnight crossing we arrived at the ECO resort to find the moorings untenable in the northerly swell. This swell must have arrived in the middle of the night as at this early hour in the morning the mooring area was full of boats cab horsing like crazy and we could see people getting up and ready to leave the area in a hurry. After a couple of days in Hamilton Marina we decided to go to Airlie Beach to replenish our food stocks. Hamilton is not a good place for provisioning, they cater for the charter business and you pay high prices for basic and not so basic stuff. 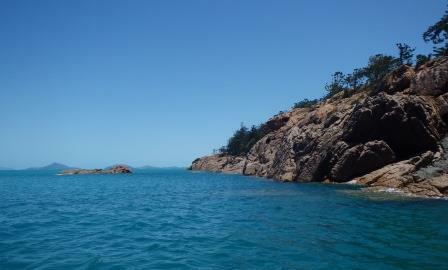 There are no other places to provision around the Whitsundays. Airlie Beach is not ideal but is the best place around. We had a lovely sail in light winds until we turned the tip of the coast around noon when the wind decided to pick up just as we entered the marina. This time we decided to try Port Airlie Marina. They have some casual berths but their intention is selling rather than renting as they are building an up market complex around the marina with residential apartments and restaurants. It is a convenient place, quite near downtown but the marina itself doesn’t seem to have a lot of protection from the prevailing easterlies. We were lucky to find a poor soul to help us with the lines as the marina, being a residential marina, doesn’t have staff around to help you docking. After a couple of days, all our provisioning done, we started to get frustrated once again with the weather, extending our departure day by day until finally the 22 October we were able to leave. 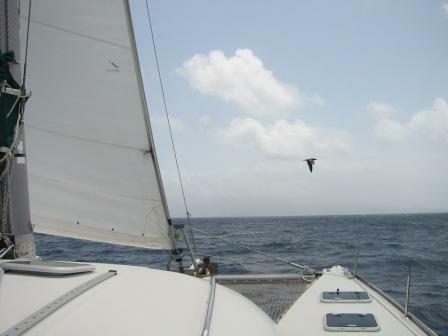 The problem is not the distance to cover until you get to one of the islands from Airlie, but the angle, no matter what island group you choose close to the coast, winds are usually on the nose. To make things worse, the area is shallow and an uncomfortable confused sea develops when the wind is just over 15 knots. Plus, you better get the current from the tides right, unless you want to drag at 3.00 knots or even less. We were trying to get to Cid Harbour but decided on Stonehaven Bay instead as the angle was a bit better, a little bumpy but Zenitude covered the 16 miles in three hours. Whitsundays are not so busy this time of the year and we were able to get a free mooring to spend the night. Previous time in the Whitsundays we missed Whitehaven Bay. This time we wanted to make sure we wouldn't miss it so we headed there after spending a night in Stonehaven. Such an amazing beach we were glad we made it this time. You can anchor almost anywhere alongside the beach but the most protected area is towards the south end. The problem is this part of the beach is totally crowded with day visitors, including the little seaplanes that bring couples for a romantic time at the beach. Our strategy worked out well by spending daytime at anchor in the isolated places and going back to the good anchorage for the night. We found that by evening this place is usually quiet, except for the camping area that seems to have visitors most of the time. Even if you anchor at the south end, don’t miss a dinghy exploration inside Hill Inlet at the north end of Whitehaven beach. It is amazingly beautiful and quite large. It seems possible to enter the inlet at high tide depending on your draft, but we are not as adventuress as the entrance channel is not chartered and almost dries at low tide. We anchored at the northern end of the beach and went for a dinghy ride. At the very end of the northern side there is a walking track that takes you to the next bay, but we haven’t tried that. From Whitehaven we sailed to Haslewood Island thru the Solway passage to anchor in White Bay. This is not a very popular bay but it was surprisingly ‘crowded’ with three other boats. We landed in another beautiful beach and later on went snorkelling. The water was not crystal clear but snorkelling was nice, pretty coral and lots of giant clams. Having visited the beach and done some snorkelling in White Bay we were ready to move again as we were not very comfortable spending the night in this anchorage. After a couple of hours we arrived at Plantation Bay in Lindeman Island, about 9 miles away, where we found yet another beautiful bay. As the weather continued to treat us with kindness with fantastic days and very light northerlies we were able to visit all the places that are usually untenable with the prevailing south easterlies. This time we wanted to go a little further to Thomas Island and check out the anchorage we had passed by three months before on our way up north. The anchorage on the southeast tip of the island looks like a fantastic spearfishing spot, Thomas being one of the few islands in the Whitsundays where spearfishing is allowed. It is a wonderful spot, really pretty, surrounded by reef but a disappointment for Oscar. We arrived to find a good anchor spot and were happy to have arrived early as many other people had the same idea and a couple of hours later the bay, which is not very big, was quite full. It seems that the fish were enjoying themselves somewhere else, probably in the many National Park protected areas. Not a single fish for dinner. On our last day before returning to Hamilton we visited Turtle Bay, another quite popular anchorage only viable in these weather conditions. This is quite close to Hamilton and it was very crowded when we arrived. As the day passed people wondered to other areas and it was pretty pleasant and quiet during the night. Next morning we headed to Hamilton, where Zenitude will stay for about three weeks while we travel to Sydney to visit family and take over some work, just a break on our wonderful cruising life. We left Orpheus heading back to Magnetic Island, just for a good night of sleep. Very early next morning we set sail towards the South. Forecast was just for a couple of days ENE before the return of the south easterlies so we decided we could afford one stop at Cape Bowling Green for one night, as we targeted to make it to the Whitsundays in this window. What a beautiful quiet and peaceful anchorage, with right weather of course. It’s a very wide bay with a beach as long as the eye can see. Fishing motor boats visit this area which is quite close to Townsville. Around we went and anchored in Breakfast Bay which was calm and protected, at least long enough to let us catch up on some sleep. However, the forecast was not good for the area and when we left around noon the wind had started to pick up. It must have been a good decision, it was an exodus, I think we were one of the last to leave. Early that afternoon we arrived at Hamilton Marina where we decided to stay for a couple of days to fix the lazy jack, provision and hide from the southerly change with strong winds.